Worms, crickets, dung beetles — to most people they’re just creepy crawlers. 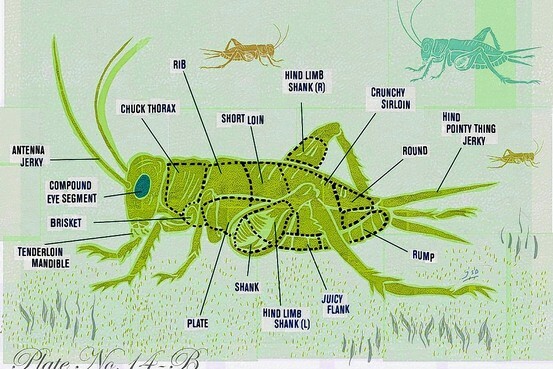 To Brooklyn painter and art professor Marc Dennis, they’re yummy ingredients for his Bug Dinners. The vast majority of the developing world already eats insects. In Laos and Thailand, weaver-ant pupae are a highly prized and nutritious delicacy. They are prepared with shallots, lettuce, chilies, lime and spices and served with sticky rice. Further back in history, the ancient Romans considered beetle larvae to be gourmet fare, and the Old Testament mentions eating crickets and grasshoppers. In the 20th century, the Japanese emperor Hirohito’s favorite meal was a mixture of cooked rice, canned wasps (including larvae, pupae and adults), soy sauce and sugar.